Every year, music gear manufacturers flood the market with revolutionary products. 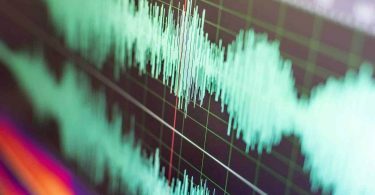 The music world is currently experiencing the golden age of home recording and live performance technology. And the TC-Helicon device is at the head of the pack. Acts like Bon Iver, Lambchop, and many others use TC-Helicon products for the studio and live performances. However, with 25 vocal processing products, it can be hard to figure out which one is right for you. It depends on what you need, but the TC-Helicon VoiceLive 3 is hands down one of the best vocal processing products available. Whether you’re a singer-songwriter or a Platinum-certified vocalist, the VoiceLive 3 can do just about anything you want. What you choose to buy depends on your budget and the features you need. So keep reading to learn more about the VoiceLive 3 and the TC-Helicon device. 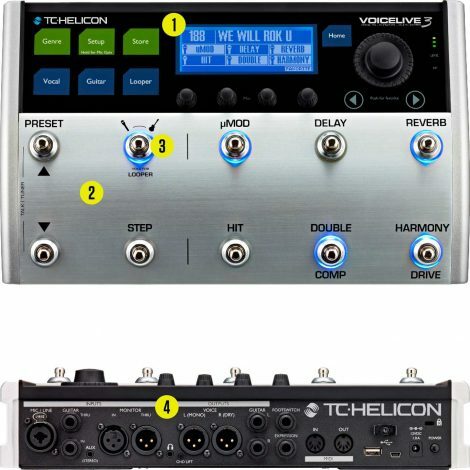 The VoiceLive 3 is the clear winner in this list of the best TC-Helicon device options. It has a variation of nearly every feature that TC-Helicon offers. It provides ample looping time, practical usability, and effects for both vocals and instruments. But the main thing that sets this unit apart from the other products is the ability to use an instrument. Also, because of the many things it can do with and to your guitar can save you a fortune in effects pedals. For instance, maybe you don’t want to buy a dedicated chorus pedal, but you want a good-sounding chorus on one or two songs. Just by having the VoiceLive 3, you can save money on effects you may not need to use often. If you’re a vocalist, even if you don’t play an instrument, the VoiceLive 3 is a bargain compared to the individual stompboxes. For the price of four or five individual stompboxes, you have access to substantially more features than an entire arsenal of stompboxes. For that reason alone, the price tag is justifiable, and the unit is an investment. The in-depth menu options and the range of parameters you can control make the VoiceLive 3 a value regardless of whether you play an instrument. Realistically, there are only a few features this unit lacks, which are unpractical of features in the first place. The VoiceLive 3 is the most effective, affordable tool for vocalists on the market right now. Working in the studio is one thing, but using an old laptop with live plugins is risky business. There’s nothing worse than experiencing infinite sustain on a midi-keyboard in the middle of a concert. Many singers and musicians use the TC-Helicon Mic Mechanic. It is a top selling TC-Helicon device. However, some musicians are skeptical of multi-effects units. When multi-effects units first gained popularity among amateur musicians in the 90’s, they were awful. So, this is why some performers are biased against them. 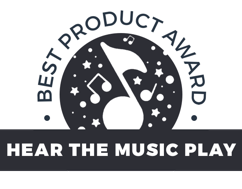 However, after thorough testing, reading hundreds of reviews, watching hours of demos, having countless discussions on forums, and discovering some of the top artists who use their products, it is clear that TC-Helicon knows what they’re doing. TC-Helicon currently produces six multi-effects floor units aimed at different kinds of players. A TC-Helicon device is mainly for people who play an instrument and sing. But they also have dedicated vocal units across their different product lines. Both TC-Helicon device choices offer over 500 presets and live looping. Also, you get a wide array of effects for your guitar and voice. The pitch correction and harmony features give you complete control over your vocal performance. And the guitar effects section features some of the most popular sounds from the TC Electronic guitar effects line. You can create up to four harmony parts and use pitch correction that ranges from subtle to robotic. This unit allows you to control specific parameters live. For example, you can add delay and harmonies, rather than just scrolling through presets. The two most feature-heavy products in the TC-Helicon device line differ in a few important ways. The VoiceLive 3 Extreme offers five hours of looping time with a limit of eight minutes per track. It also provides 45 minutes of looping time. If you like to improvise loops live, then the VoiceLive 3 is probably adequate. TC-Helicon Device Features: Do You Want to Save Loops? For musicians who like to save loops for flawless performances, the VoiceLive 3 Extreme is more up your alley. The VoiceLive 3 Extreme also allows you to automate effects by syncing to a prerecorded track. That way, you don’t have to worry about stomping on switches while performing. On top of this, the VoiceLive 3 Extreme can record your performance to a USB key in 24-bit audio. RoomSense is also an amazing feature they included in the VoiceLive 3 units. They include two small microphones in the unit that listen to the chords you play. 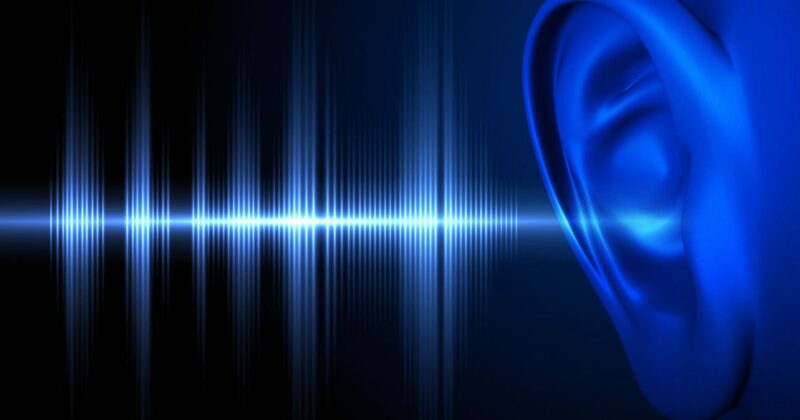 The unit takes the information it hears to give you more accurate harmonies. This lets you play songs with key changes and accidentals without having to switch to a different preset. Honestly, most musicians probably won’t need the additional features of the VoiceLive 3 Extreme. Helicon has specifically geared it towards professional musicians playing along with prerecorded tracks. The price tag difference is only about $150 if you want the additional memory slots. You’ll also get more looping time and the recording function. What you choose in a TC-Helicon device depends on the features you need. To compare the features and specs of any TC-Helicon product, you can visit TC-Helicon’s product page. These two units have many of the same features as the VoiceLive 3 TC-Helicon device models with a more affordable price tag. They cater to electric and acoustic player’s needs. Electric guitar players will appreciate the amp modeling and effects capabilities of the Play Electric unit. And acoustic players will appreciate the Play Acoustic’s powerful EQ options for creating warm, natural sounds when you plug it directly into a PA. However, there are some major drawbacks to these units. Both units offer up to one minute of looping. So, this is a step down from the 45 minutes of the VoiceLive 3 or the five hours of the VoiceLive 3 Extreme. But this shouldn’t worry you too much since looping in the context of a band is impractical. The harmony section can deliver up to two additional voices, which is probably enough for most singers. These models lack the choir feature of the VoiceLive 3 models, but this feature might sound fake in most settings. Like the VoiceLive 3 TC-Helicon device, these two units offer RoomSense and pitch correction features. This guarantees your lead vocals and harmonies will always be perfect. The biggest difference between the Play Acoustic and Play Electric is the effects section. The Play Acoustic’s effects section features reverb, modulation and EQ. Compare that to the Play Electric, which features reverb, delay, modulation, distortion, compression, EQ and amp modeling. But, most acoustic players don’t use things like distortion, so the disparity in effects is probably not a deal breaker for them. However, if you switch between guitars, your best bet is one of the VoiceLive 3 models. The great news is, you can find the Play Acoustic and the Play Electric for about half the price of the VoiceLive 3 Extreme. The Play Acoustic is a little more expensive than the Play Electric. However, they’re still incredibly affordable TC-Helicon device choices considering the powerful features they offer. If you don’t need all the bells and whistles of the bigger TC-Helicon device effects units, opt for one of the more affordable stompbox units. The stompboxes usually combine two or three specific effects for a simplified setup with powerful core features. So, if you only want two harmonies and the doubler effect, this can be an affordable solution for you. Many of TC-Helicon’s stompboxes offer pitch correction and reverb, so it can be confusing. For instance, one will have a delay and the other will have harmonies. 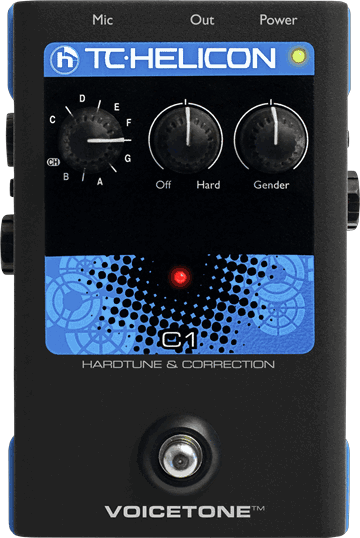 The VoiceTone Harmony-G XT is a viable option for guitarists who want vocal harmonies, pitch correction, doubling and reverb. 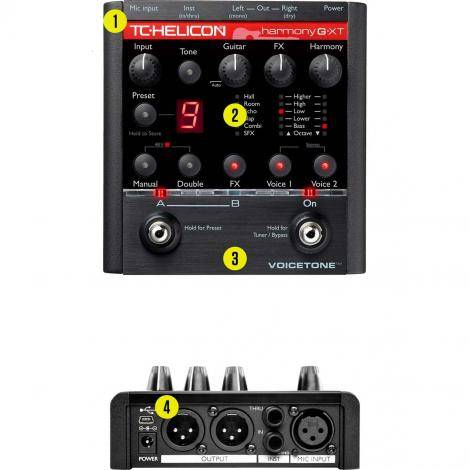 There’s also the VoiceTone Correct XT, which VoiceTone gears primarily towards singers. The VoiceTone Correct XT gives you a lot of tonal control over your voice. However, it lacks harmonies, reverb and doubling. The Mic Mechanic 2 is a solution for people who want reverb, pitch correction and echo at an affordable price. Many singers also praise the VoiceTone T1. It provides the same EQ, compression, de-esser, and warmth controls as the VoiceTone Correct XT with limited features. The only thing you need to be careful about with the single pedals is pedal order. Just like with guitar pedals, pedal order can have a huge influence on your sound. With TC-Helicon pedals, if you put a harmonizer pedal in front of a pitch correction pedal, it may not work correctly. For performers who don’t want to tap dance during their performances, TC-Helicon has mic stand-mounted units. These units are for singers who don’t play instruments. If you are a keyboardist, go for the Perform-VK. 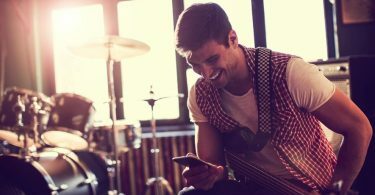 However, it could be difficult to juggle a keyboard or guitar while pressing buttons, so these may not be useful options. They sell footswitches you can use with various TC-Helicon device units, too. But having to accessorize a product to use it is a minus for most musicians. The best of these mic stand-mounted units is the VoiceLive Touch 2, an update to the previous VoiceLive Touch. 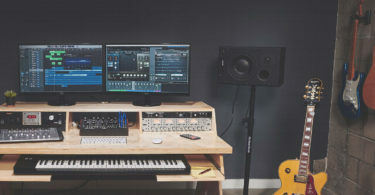 It has some great features, like looping and NaturalPlay It also comes with RoomSense for pitch correction and harmonies, as well as the slider fx control. But, this unit is your “VoiceLive 3 for dummies” option. Buying the slightly more expensive VoiceLive 3 unit is worth the price for the usability factor alone. There’s also a more affordable option that offers everything most regular singers need for a live show. Also, TC-Helicon designed the Perform-V with a straight-forward interface with many of their most powerful features. Singers can touch simple buttons to control reverb, pitch, harmonies, delay and anti-feedback. This is the ideal option for singers who want something that works with ease. You can also use a smartphone app to download sounds and send them to your unit’s presets. This feature is only available for the Perform-V and Perform-VK models, though. 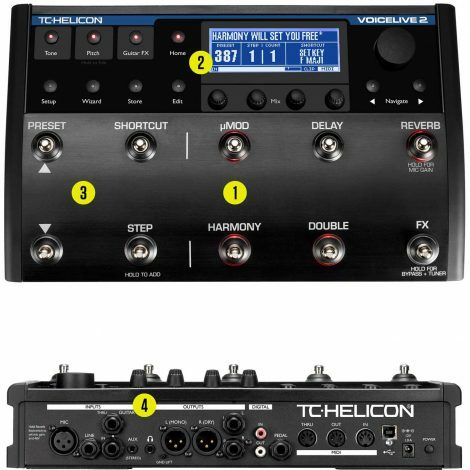 If you decide the VoiceLive 3 isn’t for you, there are some other great options from TC-Helicon. This is an efficient TC-Helicon device for dedicated vocalists. It offers pitch correction, anti-feedback, dynamics, and EQ options for great-sounding live vocals. It corrects your pitch based on a chromatic scale, so it doesn’t rely on your playing to correct the pitch. The Correct XT is a helpful tool for the inexperienced singer. If a singer hits a sour note, it will still be sour, but it will be a perfectly tuned sour note. This is one of the few units in TC-Helicon’s product line that offers anti-feedback controls, which is useful for singers who like a loud monitor mix. The dynamics controls add warmth and compression to your vocals to increase the tonal quality of your voice, as well as prevent volume spikes in your singing. 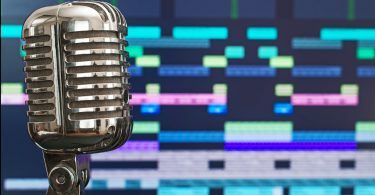 Even if you don’t play live, this is a fun tool for the at-home musician who needs to record or just practice. If you want to play guitar and sing at the same time, consider the VoiceTone Harmony-G XT. They included the NaturalPlay feature to make sure your voice is pitch-correct. It bases the sounds on the chords you’re playing, too. If you want, you can also just set the key of the song for accurate pitch correction. As the name suggests, you also can select from preset intervals for two harmony voices. Also, you get a delay and reverb section for your voice, and reverb for your guitar. The new Harmony Singer 2 is for singers who want harmonies, but don’t want pitch correction. 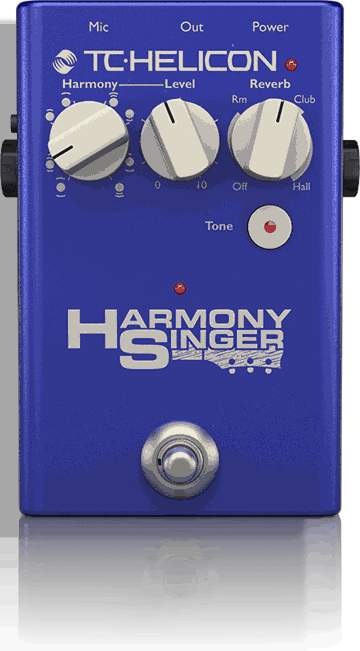 This unit gives you two harmony voices you control with a guitar. In addition, there are three reverb settings. Also, you get the adaptive tone option for compression, de-essing and gate control. 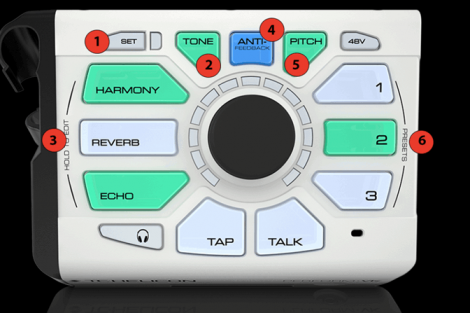 This is a slightly less expensive TC-Helicon device version of the Harmony-G XT. It lacks the guitar effects of the Harmony-G XT and some controls, but it provides the basics. You have the option to use batteries to avoid winding up cords at the end of your performance. Lastly, it comes with intelligent mic input gain for fast and easy setup. This unique product comes with key selection, hard pitch correction and a gender knob. It provides the best features of popular vocal tuning plugins. The key selection knob ensures you’re in tune with the song you’re singing. The pitch knob lets you adjust the subtleness of the effects, too. Effects can range from barely there to a hard-tuned robotic voice. The gender knob changes the tonal qualities of your voice to let you sound anywhere between Barry White and The Chipmunks. The features of the VoiceTone C1 are subtler than some of the other products. So try it first or watch videos to ensure it will be the best TC-Helicon device choice for your sound. The VoiceLive 2 is more advanced tha other products on the market. Even though it’s the previous generation’s model, it still has over 200 presets. It also provides looping, pitch correction and four harmony voices. However, the VoiceLive 2 differs in looping capabilities and the guitar effects section. Still, it can do more than all of these TC-Helicon device units combined. So this unit is a quality choice. There are fewer features than the VoiceLive 3, but it’s a great value. Check out the used market to get a better deal on one of these units.